Happy New Year!! Thanks for coming back to RUNWRIGHT for 2016. I promise this is going to be an even better year on the blog. I’ve learned some things and I can’t wait to share them with all my readers. I didn’t post my 2016 goals/resolutions on the blog yet. Somehow, even though I’ve been working on writing them down over the past few days, the blog post isn’t ready yet but it will be up over the weekend – these past few days haven’t gone as I would have expected so I am little behind on a few things. That’s probably not a good way to start the new year – lagging behind on stuff – but I typically over schedule myself – that’s my little trick to keeping myself busy. This year, I’ve decided what my focus word will be. Progress. My focus word this year is progress. There are a few goals I’ve set for myself for the past several years and they haven’t materialized. But I no longer want to focus solely on a destination, just on moving forward – I want to focus on making progress. Sometimes, a goal is unachievable – not because you don’t work towards it, not because you don’t try hard enough but because when you get there, the goal changes or you’ve changed to where the goal isn’t your target anymore. Sometimes, when you’re setting your goal, you’re not mature enough to know what your eventual goal is. With that in mind, I am focusing on making progress. Real progress. Changing for the better. Growing in very defined areas. Becoming more of the person I always wanted to be. Achieving things that are important to me. Being successful in areas that will make me proud of my work. Impacting the areas I set out to. In short, making progress. What do you think of my word? 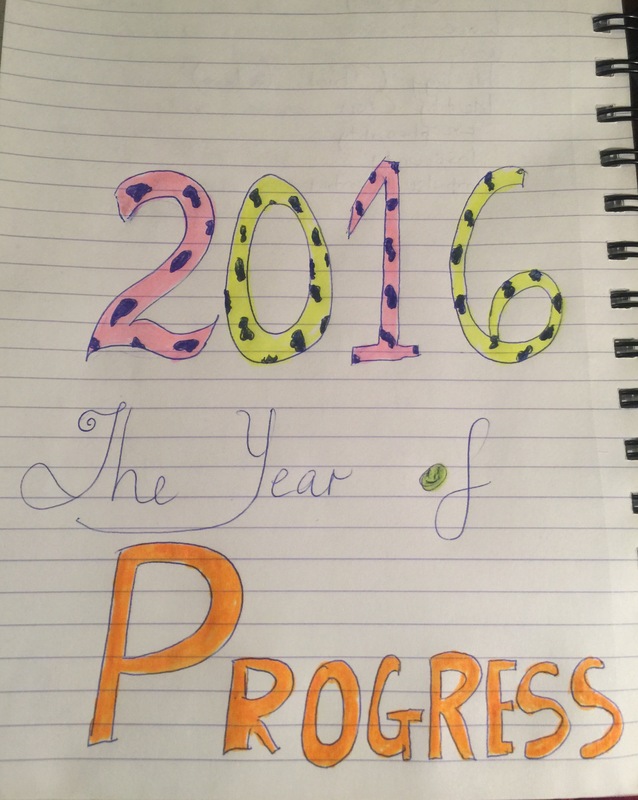 Did you make a list of 2016 resolutions/revolutions/intentions/goals? Do you have a focus word for 2016? Next Post Goals vs. Resolutions: What’s The Difference? That’s an excellent word my friend! Good luck on bringing all your visualizations to life and achieving your goals! Happy new year! Happy New Year Karen! No new years resolutions for me. I just try to take each day at a time. My w ord for this year will be Balance, as in finding balance between work and family. I like your word a lot too, I’ll definiteyl have some Progress for 2016! Awesome. Thanks and Happy New Year, Mary. Balance is a definitely something to strive for – with anything out of whack, it’s hard to enjoy the other aspects of life. Thanks for commenting, Alexandra. I set goals all through the year too – just a day after writing my goals down, I read about another reading challenge that has me itching to update my reading goals for the year. But I should focus on accomplishing these first before I move on. Thanks so much, Karen. Did you post your goals on your blog?